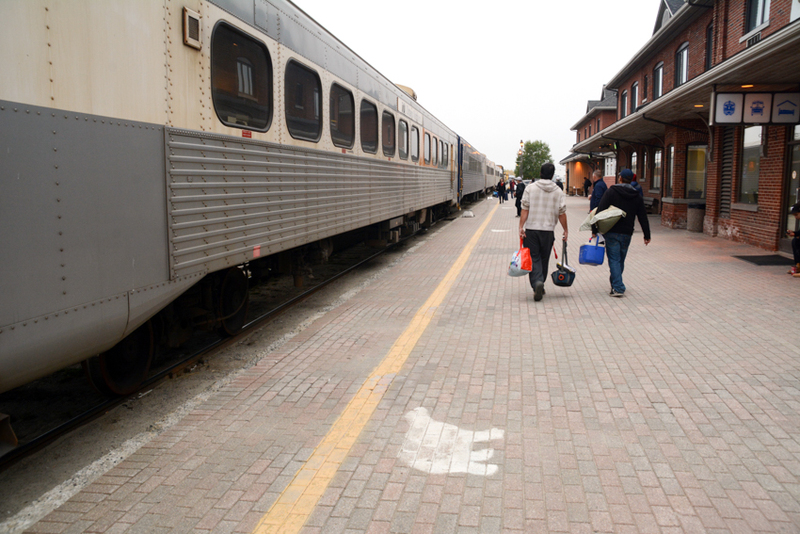 The Ontario Northland Railway station in Cochrane – a sleepy Franco-Ontarian boreal hamlet and the birthplace of Tim Horton – looked every bit the embarkation point to places off the grid. A mob of passengers waiting to board the 9:00am northbound train to Moosonee – ceremoniously dubbed The Polar Bear Express – crowded the aging departure hall. Children skipped circles around mountains of baggage bursting with purchased goods unavailable or prohibitively expensive at our destination, 300 kilometres distant. With every seat taken in the lounge, I milled about the lonely platform, enduring a blustery wind and staring down one end of the tree-lined tracks into what looked like infinity. I asked an aged man in a tattered blue railroad suit standing near me how long the ride would be. He shrugged his shoulders. The whole scene, with the biting autumn cold, made it feel like I was leaping into the distant north. But that sense of extreme remoteness was an illusion. Cochrane straddles the 49th parallel – south of every major city between Manitoba and mainland B.C. The “Polar Bear Express” getup was also a bit of fancy window dressing: those giant carnivores are an exceptional rarity where I was going (Cochrane is home to a polar bear facility, hence the moniker). Yet, even bearing that in mind, the sense of being further north remained hard to shake. Moosonee, and neighbouring Moose Factory, my final destination, was quite north when seen from the comparatively southern precincts of my hometown of Toronto. No roads lead there. It is a renowned aurora borealis viewing hub. And because the treeline in Canada reaches its lowest latitude in Ontario, the slow transition from boreal to tundra begins earlier here, belying your true position. In a nutshell: enough of the trappings of the north without being the deep north. The honourary north, perhaps? All this comes to mind as The Polar Bear Express pushes further, at the sound of horse hooves doing a tap dance, into ever-thinning stands of stunted spruce and birch. A fellow passenger from the mining mecca of Timmins, dazzles me with the gold nugget hanging off his necklace, as our train makes flagged stops to drop-off and pickup moose hunters. 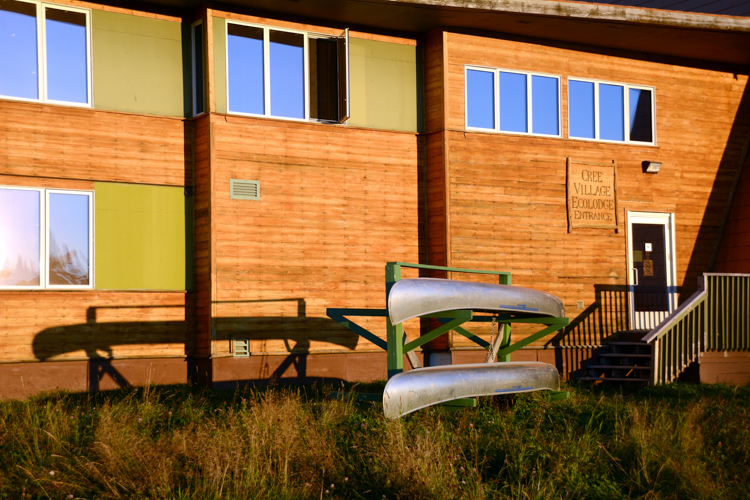 The names of the ad hoc stations resonate with the bygone eras of wilderness self-sufficiency: Foxville, Otter Rapids, Onakawana, and Tommyville. Though not north in earnest, I have entered an in-between realm, a kind of lower north, where the frequencies of deeper north resonate. It’s hard not to develop a burning curiosity about the name “Moose Factory.” These two words which should never go together, yet when paired create a noun that is inexplicably poetic, are not easily forgotten. I’ve always been drawn to remote places. In my atlas-addiction phase as a kid I’d returned to that spot on the map, time and again, wondering what could possibly be there. What I didn’t know at the time was that Moose Factory, beyond its colourful and evocative name, was also historically significant. Originally called Moose Fort, it was established in 1673 as a trading post of the Hudson’s Bay Company – arguably its first. It was also the first English-speaking settlement in what would later become the province of Ontario. The post eventually moved upriver to its current location and in 1821 changed its name to Moose Factory – a “Factory” being a station where a resident “Factor” (a post merchant) transacted business. 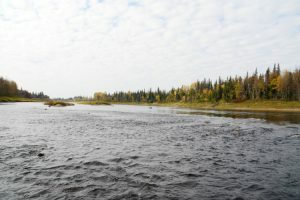 Today, Moose Factory, located on an island of the same name near the mouth of the Moose River, is inhabited by the politically divided Moose Cree and MoCreebec First Nations. Moosonee, the area’s travel and services hub, sits directly across the river on the left bank. 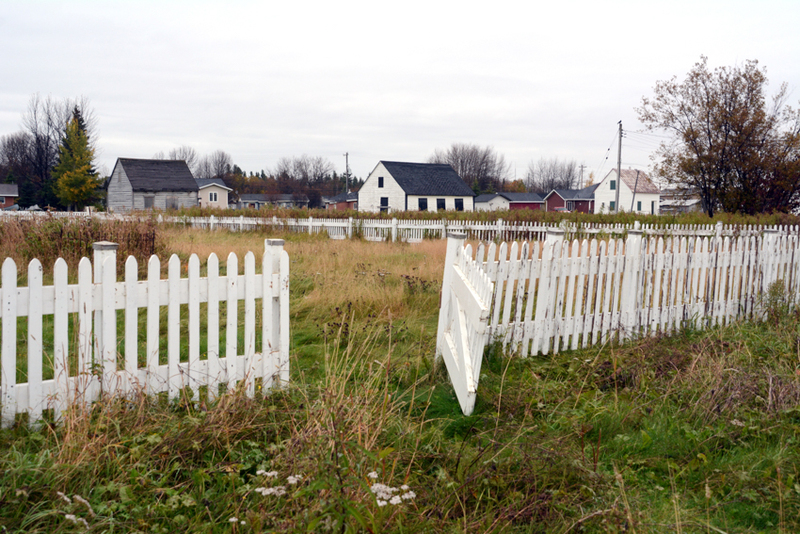 Both communities, surrounded by lowland boreal forest, are understated and unostentatious. A heavy quiet, punctuated by a restless wind, pervades the place. Beyond seeing the two towns, I’m eager to visit James Bay, whose waters and epic mudflats are a mere 20 kilometres downriver. I also hope to catch more than a glimpse of the Northern Lights, which are now in their peak period of activity. 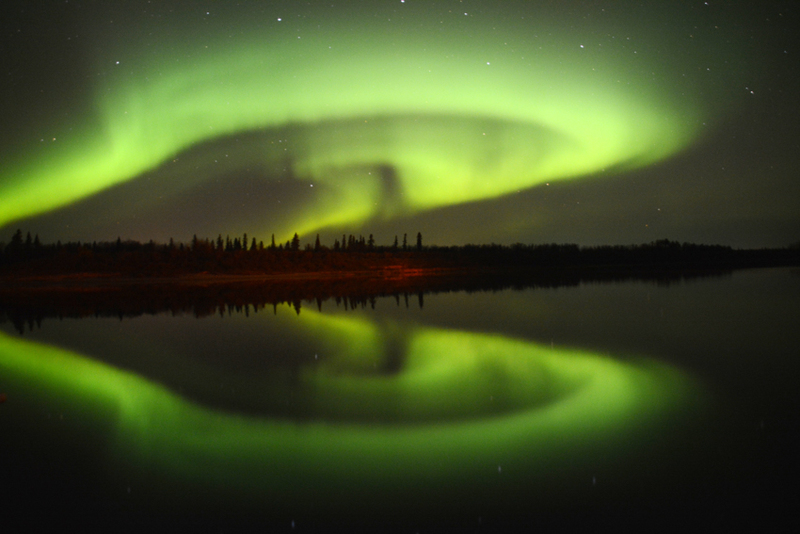 Though Moose Factory sits at the same latitude as Calgary, London and Berlin, it is a key node of aurora activity – one of the best places in the lower northern latitudes to see them. The unpredictable and fickle nature of the lights and the often-overcast weather of early autumn makes seeing them a very hit-and-miss affair (more miss than hit). 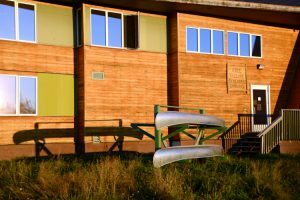 I’m staying at Cree Village Ecolodge, an architecturally savvy 19-room accommodation that was the brainchild of the late MoCreebec Chief, Randy Kapashesit. The award-winning riverside lodge, which has been operating since 2000, is the only real accommodation on the island. Even with the accolades, the sort of operational success Kapashesit envisioned has been elusive owing to the lodge’s relative obscurity. I get a taste of that ambience as I step out onto the lodge’s back promontory overlooking the Moose River and tree-lined shores of Sawpit and Charles Islands. Water taxis heading to and from Moosonee flit by in silhouette, cutting frothy contrails in the river. Todd Haynes, the lodge’s outgoing fiftysomething general manager from Nova Scotia, greets me on the grounds with all the enthusiasm and nervous energy redolent of a state visit. His preppy ’80s haircut, shorts and loafers are a nice casual contrast to his formal professionalism and diplomatic manner. “If this weather holds you might get a light show in the next few nights. Any idea what you’d like to do while you’re here?” he asks, adding that the lodge can organize outdoors adventures on my behalf. When I tell him I’d like to take a boat up to James Bay, his expression becomes tentative. The next day I’m travelling up the Moose River in the early dawn in a large canoe-shaped boat rigged with an outboard motor and canopy. I’m headed for the mouth of the North French River, a 320-kilometer-long tributary of the Moose, considered Ontario’s most pristine watershed. Leading the trip is 52 year-old Mike Naponse, an Ojibwa from Sudbury who married into the MoCreebec. True to Todd’s description, Mike, who refers to himself as “Spirit Buffalo Man” (his traditional name), is big, burly and loud. Before becoming a guide, he worked in different parts of Canada as a logger, a truck driver and an oil patch labourer. He flips between a manner that is silent and serious with one that is comedic and tinged with a boyish mischievousness. Travelling with us is Mike’s friend, Jean-Pierre Chabot – a thirtysomething development officer with the MoCreebec First Nation. J.P., who has East Coast and Quebecois roots, grew up in Moose Factory, and knows the region well. In contrast to Mike’s flamboyancy, he is quiet and mild mannered. The two make a complimentary team. Our daytrip will take us as far up the North French River as we can get. The excursion is a test for Mike who wants to see how far upriver, past a series of rapids, he can take his boat. As we transition from the murkier waters of the Moose River into the crystal clear North French, we start to encounter shallow rocks. “We’re gonna need a bit of extra muscle,” Mike says, before instructing J.P. and I to each grab a pair of wooden poles lying on deck. “Keep dunking the poles into the water so I can see how deep the river is. If we get stuck, we’ll use them to help push the boat through.” We soon hit the first of a pair of shoals, and for the next few hours we struggle to find a route deep enough to allow us through. At one point we get stuck and J.P. jumps into the knee-deep water to yank on the stern, while I push with the pole. After finally inching through, we find a deep section of river running near shore and follow it until we reach an impassable set of rapids. We stop and tie the boat and J.P. and I make off on our own for the afternoon to explore in a canoe, which we brought with us. When we return Mike has prepared a meal of two different stews – deer and moose – and bannock over a campfire. The fascinating cross-cultural yarn, which again reminds me that I am not that far north, prompts me to ask Mike about the possibility of visiting James Bay. Like everyone else his response is iffy: the weather would have to be nearly impeccable to risk the trip. He adds that most locals, including himself, stay on the river. Only a few brave souls venture into the open water – and even then, they do so rarely. It begins as a dim spotlight in the heavens that bleeds and spreads with the cadence of slow-moving shadow. Looking out the window of my room, it can easily be mistaken as part of the light pollution from Moosonee. But there’s a separate quality to it, a cosmic charge, that gives it a special glow. By the time I get outside onto the promontory overlooking the river, the light, now with a slight green hue, has contorted into a bold, narrow band running parallel with the horizon. A secondary layer of light, a dimmer veil of vertical streaks spectacled with starlight, ripples above. The whole scene, a sort of epic-in-progress, is reflected in the placid waters of the river. Near to me are three onlookers, hotel guests, engrossed in their cameras. I set up my own and spend the next few hours with my neck craned, staring into the sky. The aurora morphs, forming additional concentric smears of flaming green light with a purple penumbra that twists and turns in the sky like curtain bottoms blowing in a breeze. At times it recedes, teasingly, before extending itself again with the furtiveness of an octopus. I lose myself in the spectacle, at one point realizing that I’d never spent so much time looking up at the sky in one go. At the height of the show, about a dozen young medical staff, out-of-towners working at the nearby hospital, show up. Todd, the manager of the lodge also emerges. We’re banded – and bonded – together like a greeting party awaiting visitors from outer space. Everyone says this is the brightest display of the lights so far this season. Then as unexpectedly as they began, the lights recede. Some people shuffle off. Others, hoping for a second (solar) wind, remain glued to their cameras. It’s easy to keep watching, to stay the whole night if need be. But I force myself to turn in. I’d need my energy the following day. In spite of the dangers, a tentative decision was made the day before to make a run to James Bay. An informal council of Todd, J.P., Mike, and myself, plus a few others pulled in to create a quorum, huddle outside the lodge that morning to ratify the decision. The weather is clear, but brisk. The water on the river and bay will be rough, but we’d risk it. We let everyone know of our plans, and hope for the best. No sooner had the invisible gavel come down were Mike, J.P. and I on the boat racing north past Moosonee, bobbing up and down in chop whipped up by winds coming from the bay. Our exact destination is the outer shores of Ship Sands Island – located on the western flats of the river mouth as it becomes the bay. 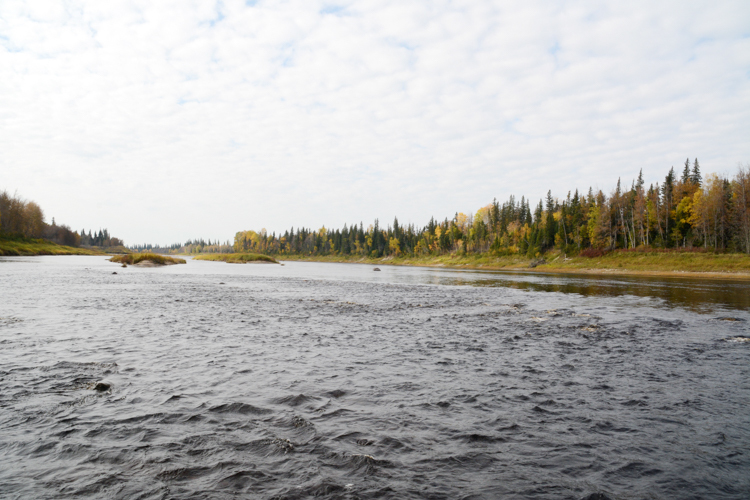 The Moose River Bird Sanctuary, a major staging area for migrating fowl in the autumn, is found there. As we push north, the river widens considerably, and I begin to understand the hesitation of locals to venture this far out. Before the Hudson’s Bay Company established its first official outpost on Hayes Island, later moving it to nearby Moose Factory, they were said to have set up an early proto-trading site on James Bay. They asked the Cree, clustered around the North French River, to travel with their furs there. But the Cree refused, owing to the dangers. Hayes Island and then nearby Moose Factory was ultimately the compromise, becoming the middle ground for trade, being equidistant and well-shielded from the dangerous winds. Mike points to his depth finder and compass. “Back in the day of the birch bark canoe, you didn’t have these gizmos,” he says. 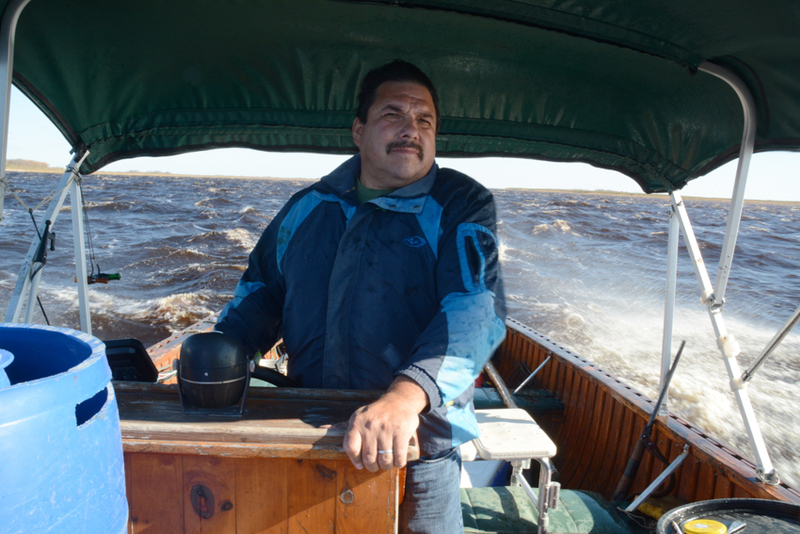 “People here had to read the water and sky – just like reading a newspaper.” Mike goes on to say that residents of Moose Factory and Moosonee, a riverine people with a natural fear of the bay, will not venture into the open water without an extra engine – just in case. 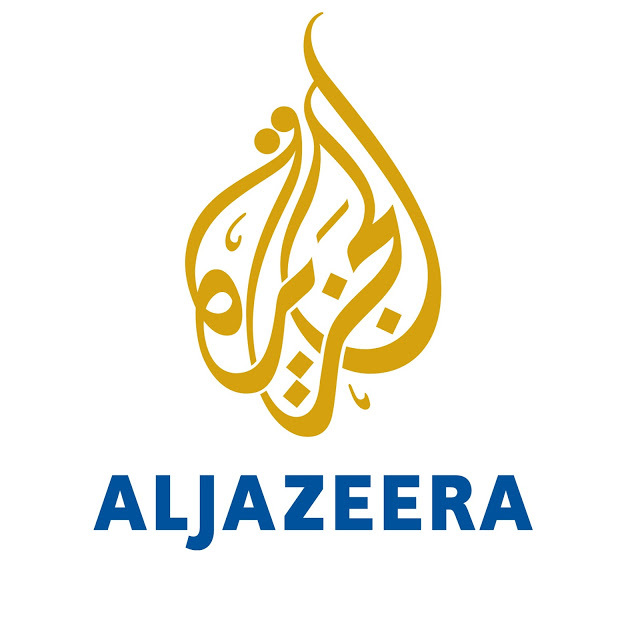 Scores of people, he reminds me, have lost their lives out there. The wind gusts strengthen. The swells grow. We keep checking our phones to determine the very last place with cell phone reception – as if that were the borderline where danger begins in earnest. Mike’s wife, who has my number, keeps texting to see if we’re OK. A speed boat comes tearing in our direction from the bay. The men on the boat have their arms raised. They seem to be waving us back inland, but I can’t tell. I feel a pull to return. But I ignore it. I’m dying to reach the sea, to smell the ocean air and feel that openness to the outside world. Soon we see the bay: a short horizon of water between the river’s two shores. It widens as we approach. But as we get closer, the waves also get bigger. The winds start to howl and slam into us incessantly. Everywhere the water froths with breakers, looking like one long massive set of rapids. Mike grimaces as he steers the boat through the chop, drenching us with spray. The conditions are now more than sketchy. I’m waiting for Mike or J.P. to pull the plug on our mission. Yet no one says a word. When I take a long look at Mike and see both the exertion and restraint on his face, I realize his pride may be too great to cut a unilateral retreat. Our veritable comedian has also stopped cracking jokes – a universal indicator that something’s not quite right. “Maybe we should turn back?” I shout. The words are equal parts suggestion and question. “Let’s do it,” the others say in near unison. Mike throttles the engine and banks hard turning the boat 180 degrees as the waves we’d been riding slam into our side. We all breathe a sigh of relief as the boat straightens. But we’ve covered a lot of distance – the return journey will be just as rough. 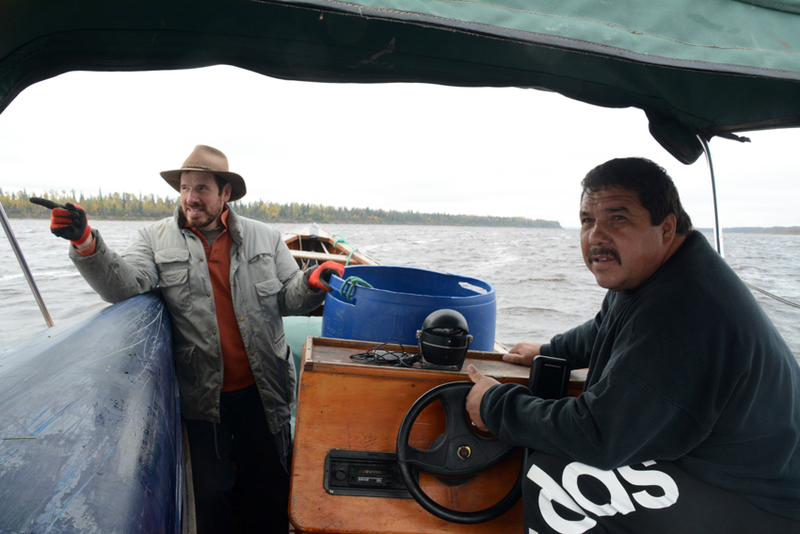 When we reach Moose Factory Island, the wind has not abated, but the swells have lessened. I’m glad to be back. A version of this article ran in the Summer 2017 issue of Explore magazine.